Market leading salad brand, Florette, is set to spread some Christmas joy this festive season by launching a limited-edition version of its much-loved Crispy range. ‘We wish you a Merry Crispy’ will be available in retailers, wholesale and convenience stores across the country from Wednesday 19th December until Monday 31st December, ensuring all occasions over the festive season are catered for. The design, which will affect all 170g Crispy products, incorporates golden snowflakes and the use of traditional Christmas colours to bring some sparkle to salad this festive season. In addition, the Merry Crispy pack includes a coupon on the reverse, offering customers 50p off in the UK and 50c off in the Republic of Ireland, which can be redeemed in store during January and February 2019 on any Florette product. Rebecca Walker, Brand Manager at Florette commented: “Crispy is our most popular product, so it only seemed right that we got into the festive spirt with a limited-edition pack! We also wanted to reward shoppers with a money off voucher to help kick start their healthy eating regimes in the New Year. “Florette ensures that only the very best quality leaves make it into each of our products so that our salad stays fresher for longer. This means that consumers can buy Merry Crispy in advance of Christmas celebrations, safe in the knowledge that it will last throughout the festive period. The launch of the Christmas packaging is one of several innovations in the pipeline for Florette, with 2019 set to bring a range of exciting NPD. 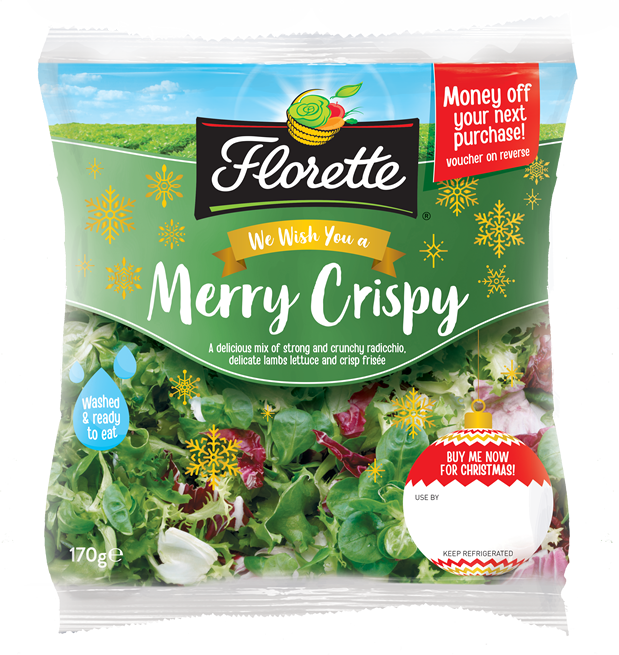 Florette’s ‘We wish you a Merry Crispy’ products will be available to buy in all major retailers from Wednesday 19th December. For further information about Florette products and for recipe inspiration, visit www.florettesalad.co.uk.